Who else needs your space? Church halls have often been a hive of activity with anything from Boys’ Brigade to dance classes and slimming clubs. But who are you missing? How can you help your community to engage with each other and make things better? How could your church support community projects and create and nurture community at the same time? Detroit SOUP inspires me. Why? Because it’s easy and effective. 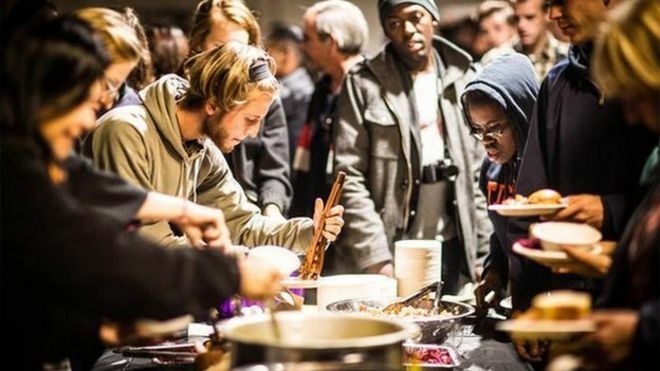 Detroit SOUP is a microgranting dinner celebrating and supporting creative projects in Detroit. For a donation $5 attendees receive soup, salad, bread and a vote and hear from four presentations ranging from art, urban agriculture, social justice, social entrepreneurs, education, technology and more. Each presenter has four minutes to share their idea and answer four questions from the audience. At the event, attendees eat, talk, share resources, enjoy art and vote on the project they think benefits the city the most. At the end of the night, we count the ballots and the winner goes home with all of the money raised to carry out their project. Winners come back to a future SOUP dinner to report their project’s progress. So, could you do something like SOUP in your church hall? So, if you want to grab a coffee and a chat with some emerging/missional types then get yourself virtually to Emerging Scotland and join up and in the real world come to Starbucks in Borders, Buchanan Street, Glasgow on Thursday 28th May at 7pm. It would be great to see you there. If you’re not in or around Glasgow then why not plan your own Meet Up where you are. Just join one of the meet up groups at Emerging Scotland. 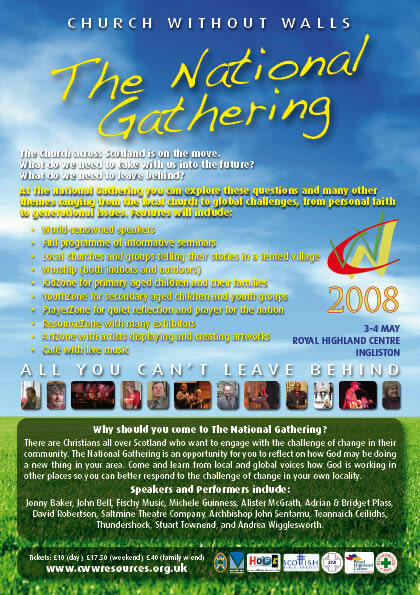 The National Gathering is on 3-4 May 2008 at the Royal Highland Centre, Ingliston near Edinburgh is in less than 3 weeks from now! The National Gathering will be one of the most encouraging, stimulating and memorable events for the whole church in Scotland in a generation or more. There will be huge celebrations of worship, keynote preachers, kids & youth programmes (check out the BEBO Page, an area for reflective prayer, art exhibitions and outdoor theatre. Speakers include Dr John Sentamu, Archbishop of York, Michele Guinness, Alister McGrath, Andrea Wigglesworth and John Bell. Modern singer/songwriter, Stuart Townend, is coming too. Although Church without Walls is a movement within the Church of Scotland, all Christian denominations in Scotland are invited to participate in the National Gathering. We hope lots of people from your church will come along to this exciting event. Click on this link to visit the National Gathering website. There you’ll find detailed information about the Saturday and Sunday programmes and you can book your tickets online. The excellent value for money prices start at £10 – or less with group discounts. There are even more generous discounts for youth groups. Perhaps your church would like to buy a story-telling tent! There’s still time. See the website for details.